Picture in your mind developer Housemarque’s distinct brand of shooter gameplay combined with input from the creator of the classic Robotron 2084, Eugene Jarvis. How crazy would that be? Super crazy, right? Well, good news, because that’s literally exactly what Nex Machina is. And it is awesome. Dashing around, saving humans, finding secrets, and blasting away at dozens upon dozens of enemies in pure twin stick shooting bliss all wrapped in incredible graphics and sound sums up Nex Machina pretty darn well, I think. Continue reading our full PS4 review for all of the details. 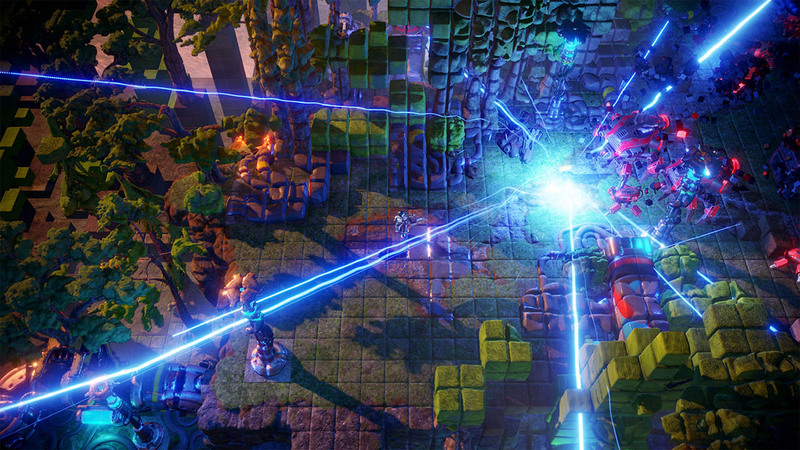 Nex Machina doesn’t have much of a story. You’re just a lone hero trying to save the last remnants of humanity during a robot apocalypse. That’s it. You just fly in on your Tron-esque light cycle and start blasting away and saving humans. Badass. Gameplay in Nex Machina is pretty straightforward twin stick shooting where the left stick moves and the right stick shoots, but there are some extra features that give it more depth. First, you can collect sub weapons that will let you fire a rocket or sustained laser blast or even use a sword for close melee combat. These powerful weapons can stem the tide of battle, but picking up the wrong one, or one you don’t like using, can also make certain sections of levels harder. Another gameplay feature is the dash ability. Dashing gives you momentary invincibility to dodge through lasers or crowds of enemies and can be upgraded to let you dash three times in a row as well as leave a little explosion behind every time you dash. Learning to combine your movement abilities plus the weapon types and upgrades is key to survival in Nex Machina. Each level is a different shape with a different arrangement of enemy types to fight through. They also all have humans wandering around that you need to save as well as secrets such as hidden humans, weapons, beacons, and more. The first time (or, heck, the tenth time) you play through a level you likely won’t find all of the secrets. This is a game designed around earning high scores and replaying it over and over and over, of course, so taking your time to learn the game and find all of the secrets is part of the fun. It also should be noted that Nex Machina is very difficult, so much so that the developer actually recommends players start on “Easy” so they can learn the game. This is advice you should follow because this game will crush you early and often. Overwhelming numbers of enemies come at you in wave after wave, but there is enough variety thrown into their ranks that means you constantly have to change tactics and techniques in order to succeed. The game is just brilliant. Don’t even get me started on later stages and boss fights that start throwing bullet hell-style walls of bullets to weave through at you. It is all just incredibly addictive and satisfying and fun. It only takes roughly an hour to play through Nex Machina’s arcade mode but, as I mentioned, it is full of secrets and very replayable so the length isn’t an issue at all. You can also play through single worlds to practice as well as play an arena mode that tasks you with setting high scores to climb online leaderboards. The game also has a local co-op mode (local only, no online) that is at the same time fantastic but also somewhat disappointing. It is fantastic, obviously, because playing co-op in these sorts of games is awesome and a ton of fun, and it does work well in Nex Machina. It is disappointing, however, because the player 2 character is colored red – the same as the enemies – and with the sheer volume of bullets flying around and things exploding it is too easy to lose track of your characters. Hopefully this oversight will be fixed via patch at some point. Presentation wise, Nex Machina is absolutely spectacular. The game world is kind of dark but it is brilliantly highlighted by brightly colored enemies and bullets and explosions and powerups constantly filling the screen. Even with dozens of enemies onscreen at once the PS4 never falters, either. It is gorgeous. The sound is fantastic as well with a thumping techno soundtrack that is perfectly suited to the laser blasting, robot killing, crazy boss fighting action. 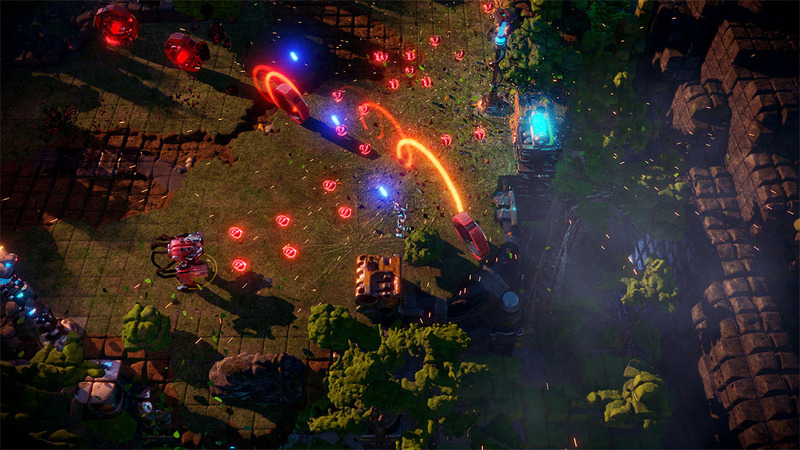 All in all, Nex Machina is a must own title for PS4 owners. It shows its Robotron 2084 influences proudly but brings the spirit of that arcade classic game fully into 2017 with smart gameplay updates and enhancements and awesome modern presentation. Nex Machina is something special and highly recommended for a purchase.